This will likely be the best book I read in 2017. 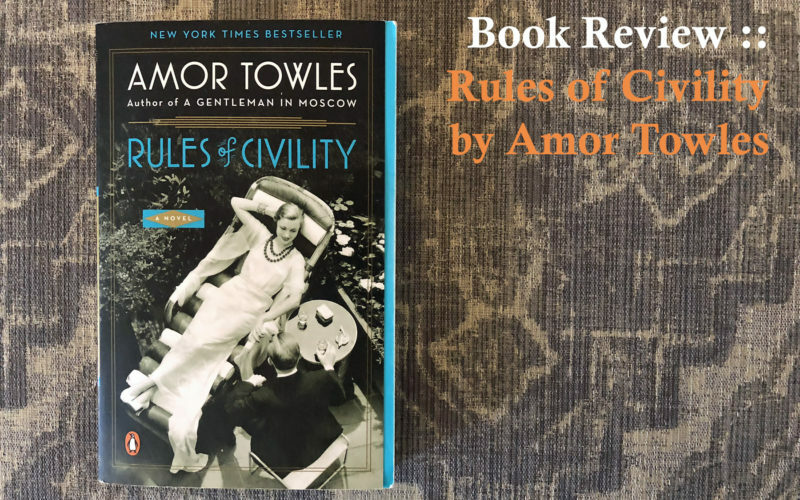 I adored A Gentleman in Moscow, and people warned me that Rules of Civility is very different. And while they are right, what makes a book great for me – richly developed characters, their flawed relationships and a perfectly drawn time and place – is served up with precision and expertise. Again. 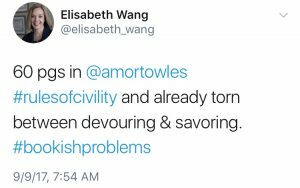 Rules of Civility begins with Kate and her husband at an art gallery. It’s the premier of a photography exhibit – portraits taken twenty-five years earlier, captured stealthily on a New York subway. Kate recognizes one of the subjects, and further realizes he appears in two photos. But so dissimilar is his appearance in the second, only a close observer would see the redundancy. In the first, he’s gaunt and disheveled, in need of a shave. It’s an accurate portrait of the realities of the City. In the second, he is impeccably dressed, the epitome of promise and an equal truth of what the City can offer. The dichotomy of the portraits, and the understanding that they don’t depict a tale of rags to riches but one of opulence to obscurity, ushers in Kate’s story of 1938, when on the eve of the year, she and her boarding house roommate meet a dashing stranger named Tinker Grey. With this chance encounter comes a year of opportunity among the City’s elite and those striving to be so. And the lesson that the difference between the two is often tough to distinguish. I forced myself to take more than a week to finish it. The story begs to be discussed. To delve into the complexities of the characters and swap favorite quotes that cut poignantly at the human condition or just perfectly capture a common regard. Balmy breeze, turquoise seas, Caribbean rum, these are well-established aphrodisiacs. But so too are proximity and necessity and the threat of despair. Not only did they have manners, they thought them worth preserving. [I]n moments of high emotion…if the next thing you’re going to say makes you feel better, then it’s probably the wrong thing to say. Most people have more needs than wants. That’s why they live the lives they do. But the world is run by those whose wants outstrip their needs. And while I could go on and on, I would rather you spend the time finding a copy for yourself. 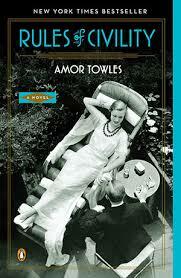 Update: I got to hear Amor Towles speak live and talk about A Gentleman in Moscow and Rules of Civility. You may be interested in that post here.